Women love to purchase every kitchen tool that gets their attention. It doesn’t matter whether they are in the new arrivals, or whether they have been out of fashion, if it grabs their attention, they will bag it. And soon enough, they find themselves in a situation where they are unable to organize the things that they’ve purchased. And this can be a pretty hard task if you are not able to place them in a proper way. And here come the Baskets! Ya, that’s right. When they find that they are not able to organize the things in their kitchen, they then turn to baskets which makes the process effortless. They purchase different types of baskets according to the things that they think will be kept in it. Most of these baskets are fitted in the drawers and shelves. And to help you save your time, we have already done the hard research part where we accumulate the list of different types of baskets according to the different requirements that you might have. 1 – Plain Baskets: These are the most traditional type of baskets that are designed to keep almost any type of things. Whether they are utensils, or just cookies, this basket is the best. This basket does not corrode, and so you don’t have to worry about that. It also comes in different dimensions, or I might say, different sizes that fit according to your needs. 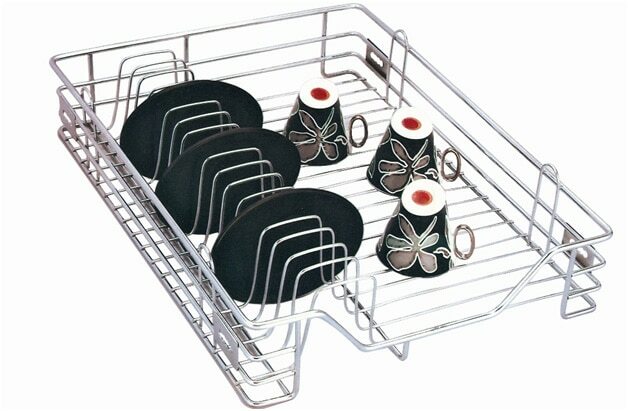 Another great use of this basket, is that you can dry the utensils in it because it doesn’t corrode. And since it comes in various sizes, you can choose the best one for you. 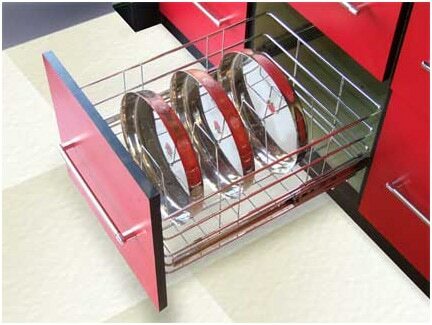 2 – Plate Baskets: These baskets are specifically designed to store plates of different sizes. Not only it provides a better place for you plates, it also provides protection so that they don’t break while being stored. This basket is completely made of stainless steel, and so you can rest assure that it will be able to handle all the weight that you impose on it. Just make sure that you don’t put wet plates in it, because then you might slip and fall while reaching to take one. 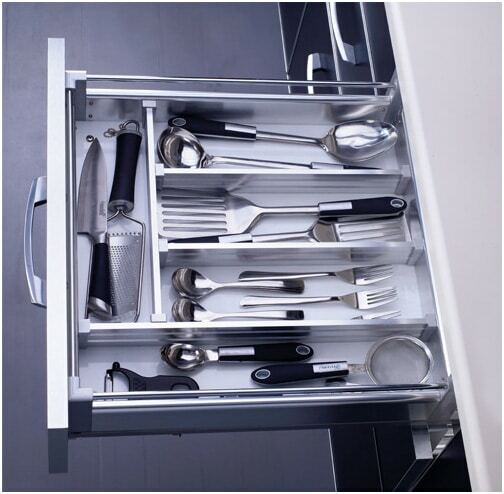 3 –The Cutlery Basket: This basket is basically designed to keep all of your cutleries in one place and in an organized manner. Cutleries are the things that we struggle to keep in an organized way, but that will not be an issue from now. 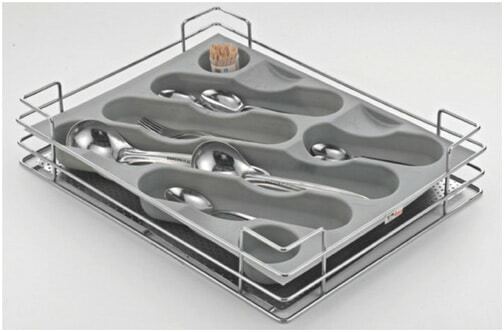 There are different compartments for different things, such as knifes, spoons, and forks. Also, if you want, you can purchase the normal basket along with a removable cutlery basket that will fit into that basket. The great thing about the removable cutlery basket, is that it can be removed and washed regularly, unlike the other cutlery basket. 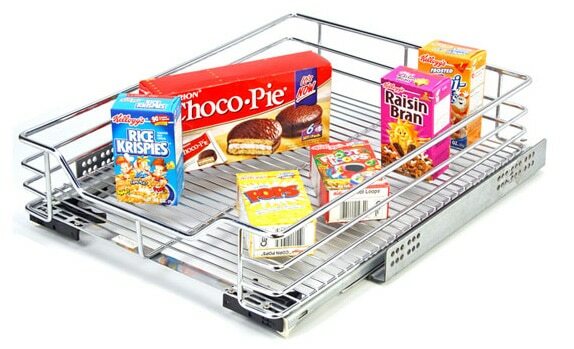 4 – The Partition Basket: These are the baskets that people purchase when they want to keep different things but want to have a partition so that it looks neat and tidy. You can store anywhere from spoons to different glasses and cups in this basket. These baskets are corrosion resistant and durable because of the purpose that it serves. 5 – The Cup and Saucer Basket: As the name suggests, this basket is specifically designed to keep your cups and saucers in an organized manner. 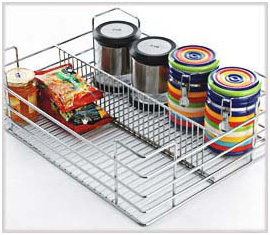 6 – The Plain Baskets: These baskets are not specifically designed for anything, but anything can be stored in it. 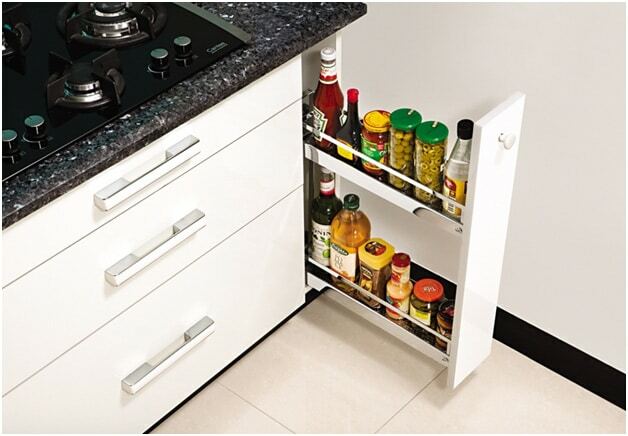 Whether you want to store cups, or spices. 7 – The Bottle Baskets: These baskets are specifically designed to keep your vinegar bottles in place. We all agree that we keep those bottles in a corner where it gathers dust. But with the help of this basket, we can keep them in a better place. Even if you purchase baskets for every different type of storage, it would be enough for you to organize your whole kitchen in a better way. Moreover, it would give you better access to items so that you will not to go on a searching spree from time to time. 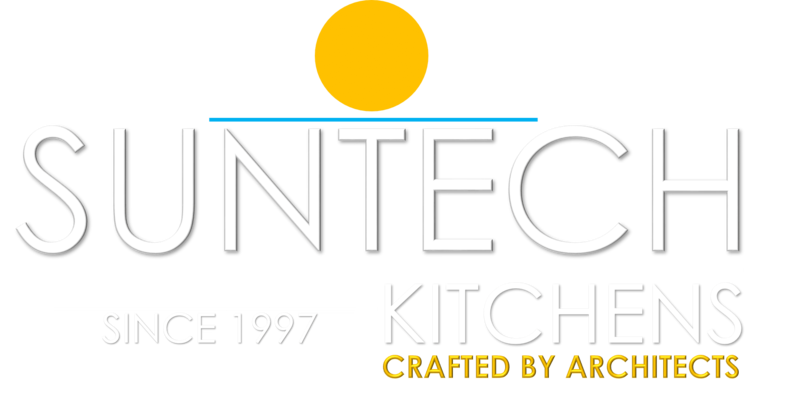 I am looking for some improvement in Kitchen, a Crockery Cabinet for living room , Dinning Table ,LED Panel and some Bathroom Sink Vanity etc for my Flat at Zirakpur.